So during my spare time I have been working on a wedding site for myself and its written in a coworker's Coldfusion framework ColdMVC. Within learning the language I decided I was going to create my own custom helper for a modal window. I went with the jQuery modal library jQModal. The way I created the helper you can use whatever modal window library you want this is just one that I like. But anyways enough with that let's look at some code. 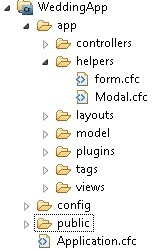 So a typical ColdMVC directory will look like this. Inside I have a Helpers folder. This folder is where you will put your CFCs that contain your helper functions. I do believe you can override the built in functions if they are the same name and function name? I am not positive but I can find out. My modal CFC contains one function called display and this is where you would put your HTML to render your modal window. Since I went with jQModal I have had to add some certain classes that only pertain to that library. Your function might be different. The function itself accepts an ID which is required and must be unique. This is for the fact that if you want to have multiple modal windows on your page we need them to be unique. The URL argument is used if you are doing an AJAX call. This will do a refresh every time you make a call to the modal window. The content argument is used if you want to send in content to the window by using cfsavecontent and passing the variable to the function. The label argument is used for the link. This can be modified if you want to do something different to display for the user to trigger the modal window. Title is the title of the argument. By default the window will just say "Modal Window" this is incase I forgot to include a title of course you don't HAVE to have a title, but I like it. Loading is just some HTML that I display for the AJAX calls so the user just doesn't see a blank window. Now if you are not familiar with ColdMVC I suggest visiting: Tony Nelson's blog and read up on some of his posts explaining the ins and outs on the framework. But just for this blog I will explain that $ replaces the helper scope inside ColdMVC so you don't have to type out helpers every time. That's one way I call the modal helper. The next way is by making an AJAX request. Note I am in no way the best designer. I am sure someone could design a better window. I am up for suggestions. This is probably well known, but I wanted a reference so I can use it again later. Hope this helps someone. So a coworker found this out if you run this test page Coldfusion will return that the cfcatch is not a struct even though when you dump the variable it says that it is a struct. Also on the argument in the function if you put a type="struct" Coldfusion will error out saying that it is not a struct. I have filed a bug here: Bug Also it turns out that it is not just a CF9 issue I have seen it as well in my local CF8 instance. Ray did a good job at talking about SQLite and the basic information on SQLite. I have not used SQLite before and wasn't aware of some of it's functionality and it's limitations. Must be done at creation! Gives you access to tables, views, columns. I was unsure of what to expect at this presentation. But I agreed with Brian on a lot of how Object Orientation in Coldfusion has become over complicated when developing Coldfusion is supposed to be simpler. Though OO Coldfusion didn't become popular until components, you could do using custom tags since CF 4 with some issues, Remember Spectra? That's not to say that you need these frameworks to develop OO CF; all are optional. Jason Dean did a very good job on this presentation. It was VERY informational on AIR security. If you do nothing else in your first version, make sure your app is self updating. Developers should not use the file system that could harm the system. Persistent Storage but can be lost. Is any part of the dynamic statement from a third-party? Except while the page is loading. Of course just like in the browser, traffic is viewable. SSL will only protect from eaves droppers. Other apps can read contents or even all. The first of the sessions I attended. This session I really liked. I have never really looked at the different rules that websites can break causing pages to be slower. This session was VERY informational and probably one of my favorites. Peter Farrell did a really good job with this session. And here is the notes. Also this is just a copy paste from OneNote so I apologize for the weird icons. 80% of the time a page loads is spent on HTTP request. 20% is spent on back end requests like queries. Combine JS files into 1 file. IE caches DNS lookups for 20 minutes. Too many hosts can penalize a page. Limit to 2-4 hosts per page. Trailing /s can cause penalties. Load first image instead of the rest. I am currently attending this great conference. I will probably post my notes on here that I take throughout the conference. So I have been on the private beta of CFBuilder since it was Bolt when it first went to private testing and have loved most of it. I love the Extensions, the RDS is pretty cool, and being able to manage my servers inside the IDE is pretty slick. Although I have dealt with all the performance issues between each release I do have to say that I am in love with CFBuilder. Unfortunately what has killed most of my love for Builder is the price tag. $300 is a bit much for an IDE. Especially since there are a few really good ones that are free. Now you don't get as much of the cool stuff Builder offers, but it is pretty darn close. Also, $300 is fine when you are purchasing one license and that is it. As some people know I work at a pretty big Coldfusion shop. There are probably about 50 CF developers maybe. And at $300 bucks its a bit much. Event if they could do half off that is that is still $7,500 total. I don't know, it hurts me to switch off but I think I will live.